Big releases attract big talent, and epic songs have the biggest and best producers in the world begging to give the ideas their own, unique spin. 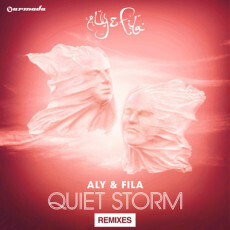 It’s a well-established fact that Aly & Fila carry some serious clout in the industry, and the volume and quality of talent that jumped on the chance to remix ‘Quiet Storm’ will substantiate this claim. Expect everything from melodic, uplifting remixes, to all-out trance smashers rocking the upper BPMs on this new release, and expect quality worthy of the name of the original creators. Mark Sherry, John O’Callaghan (who collaborated on the original record as well), Ruben de Ronde, Heatbeat, and a host of other elite producers took a crack at this record, and the diversity and quality of the results speak for themselves. Aly & Fila even took three remixes into their own hands for this release, making sure that absolutely every angle was covered for their live sets. From the SkyPatrol remix of ‘City of Angels’ to the intense A&Z remix of ‘Tula’, there are remixes that take this record from the largest venues straight to an Ibiza beach (Akira Kayosa & Hugh Tolland’s ‘First Sun’ rework). ‘Quiet Storm (The Remixes)’ is a masterpiece of the latest and greatest in the world of trance, and demonstrates beyond a shadow of a doubt that the best years of the genre are still to come. It’s impossible to not get inspired when listening to songs with this much power, energy, and mastery, and the album will give you 25 new reasons to fall in love with ‘Quiet Storm’ all over again.